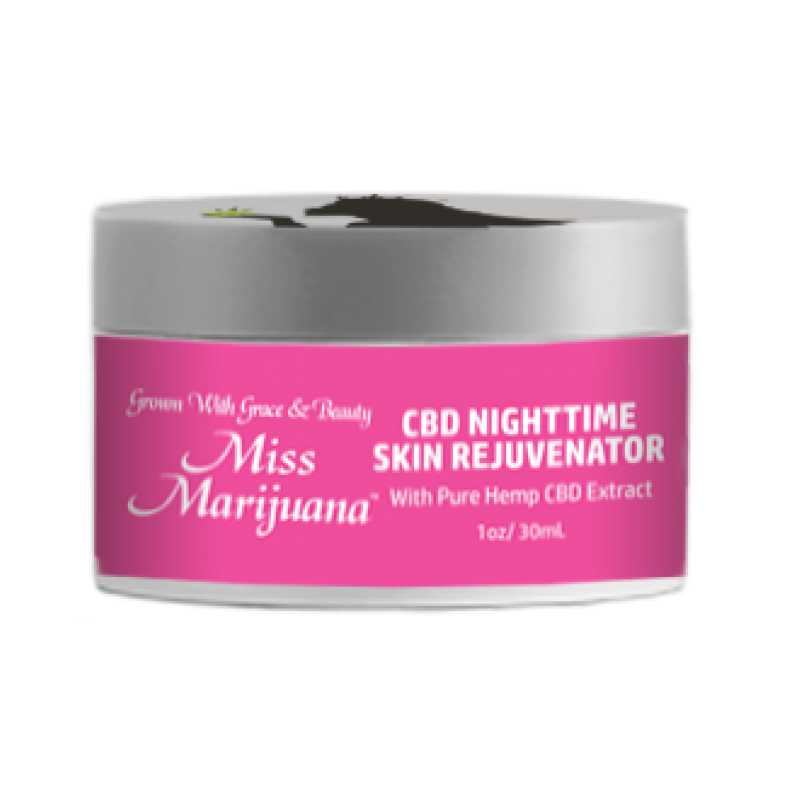 Our CBD Nighttime Skin Rejuvenator will surely become a staple in your daily skin care routine! Its a great solution for dryness, loss elasticity and for all skin types! Designed to plump and renew, this cream helps to accelerate surface cell regeneration so you wake up to intensely moisturized skin. Our night cream formula with CBD Hemp oil continuously moisturizes throughout the night leaving your skin revived in the morning. Beauty sleep never looked so good. This ultra-hydrating overnight facial cream combats the appearance of aging doing all the work, while you sleep. The skin has a nightly repair phase that this product takes advantage of and works in combination with your body’s natural process. Our unique formula includes a special blend of botanicals and cannabidol (CBD) which will moisturize, smooth and help restore the elasticity that the stress of the day may take away. This cream is a great solution for dry, saggy skin that contains fine lines and natural age lines. This is a great choice for all skin types. We suggest that you apply to the cream to the face as part of your nightly regimen. When you awake, you will truly know what it means to get your beauty sleep. The moisturized complexion will appear both firmer and smoother. The best part is that this product has a lasting result. INGREDIENTS: Water (Aqua), Caprylic/Capric Triglyceride, Coco-Caprylate/Caprate, Glycerin, Dipeptide Diaminobutyroyl Benzylamide Diacetate, Glyceryl Stearate, Hydroxyethyl Acrylate/Sodium Acryloyl Dimethyl Taurate Copolymer, Behenyl Alcohol, Malus Domestica Fruit Cell Culture Extract, Sodium Stearate, Shea Butter Ethyl Esters, Propanediol “Zemea”, Cetyl Alcohol, Cannabis Sativa Seed Oil Phenoxyethanol, Pentylene Glycol, Kojic Acid, Isohexadecane, Cetearyl Glucoside, Ethylhexylglycerin, Cetearyl Alcohol, Sodium Hyaluronate, Polysorbate-60, Caprylyl Glycol, Aloe Barbadensis (Aloe Vera) Leaf Juice, Tocopherol, Copper Amino Acid Chelate, Tetrasodium Glutamate Diacetate, Lecithin, Fragrance (Parfum), Xanthan Gum, Squalane, Prunus Amygdalus Dulcis (Sweet Almond) Oil, Persea Gratissima (Avocado) Oil, Olea Europaea (Olive) Fruit Oil, Mango (Mangifera Indica) Butter, Hydrogenated Moringa Oil Esters, Cetearyl Olivate, Glyceryl Linoleate, Sorbitan Olivate, Lonicera Caprifolium (Honeysuckle) Flower Extract, Glyceryl Linolenate, Citric Acid. SUGGESTED USE: Apply to the face nightly before bedtime to wake up to a moisturized complexion that is both firmer and smoother.